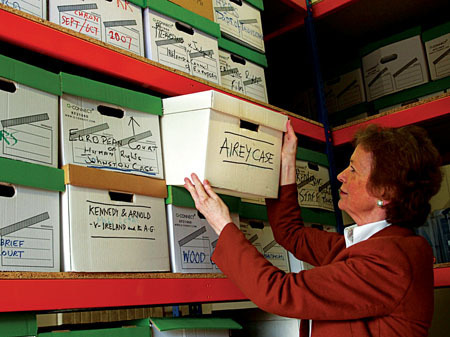 Mary Robinson’s personal archive of thousands of books and papers has been gifted to Ballina. Photo: Henry Wills. The centre is being funded to the tune of €5.5 million by Ballina Town Council, Mayo County Council, and the Government as well as the Robinson family, who gifted Victoria House for the project, and Ms Robinson herself, who is donating her personal archive, valued at a staggering €2.5 million. The balance of €2 million required for the centre is expected to come from a mix of international philanthropists and local and national donations. Susan Heffernan, project manager for the Mary Robinson Centre, told a meeting of Ballina Town Council on Wednesday night that they are “hopeful” the funding will be secured in six months so a 12-month building project can begin, which would see the centre open by early 2016. The centre is planned for Victoria House, on the banks of the River Moy, the childhood home of the former Irish president and UN High Commisioner for Human Rights, who joins Pope Francis, Angela Merkel, and Bill Clinton on a list of top 50 world leaders in the April edition of the influential Fortune Magazine. Ms Heffernan said the Mary Robinson archive will put the Moyside town on the world map as a centre for academia in the fields of human rights, women’s rights, and climate justice. She explained that top universities, including Harvard in America and Trinity College, Dublin, would certainly have liked to secure the archive for their own institutes, however Ms Robinson wanted to gift the collection of thousands of books, papers, and periodicals to her hometown instead. The Mary Robinson Centre will be Ireland’s first presidential library and is expected to generate considerable economic spin-off for the region, attracting international academics, hosting major conferences and lectures, and serving as a cultural tourism attraction. As well as academic offerings, the centre will include an exhibition of the many gifts Ms Robinson received from leaders around the world during her tenure as Irish president and an exhibition of her presidential wardrobe. The light which Ms Robinson famously placed in the window of the Áras an Uachtaráin on her inauguration will also be displayed in Ballina.